I like to look at idealized images of people. Advertising makes the biggest impact on me, for reasons I'll write about later. Before I appreciate recent images, I'll set down some notes about how this part of human culture developed. The sculpture above is known as The Venus of Willendorf. 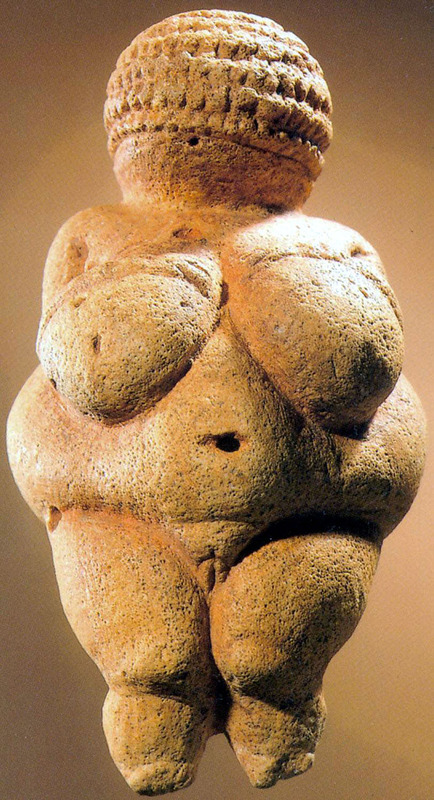 We think it was made between twenty and forty thousand years BCE. This figure may represent an ideal in the mind of its sculptor, but to us in the 21st Century, she looks shockingly familiar. This is woman in a state of nature: female, not feminine. Her body is soft and liquid, an element in the warm, primordial swamp. Femininity comes later. It is a human projection, a rebellion against the female in nature. Professor Camille Paglia details the tensions between humans, nature and culture in her magnum opus, Sexual Personae. Some modern people grow weary of modernity, and desire a life closer to that of our distant ancestors. They are greatly deluded. If you have ever worn eyeglasses or undergone dental work, you do not qualify for the life of a hunter-gatherer. All culture—almost all human activity—is a direct war on nature. Art is a lie, a denial of who we are, a plot to escape from our true place, under the heel of cruel Earth. Instead of telling the truth, art presents humans as they would like to be. 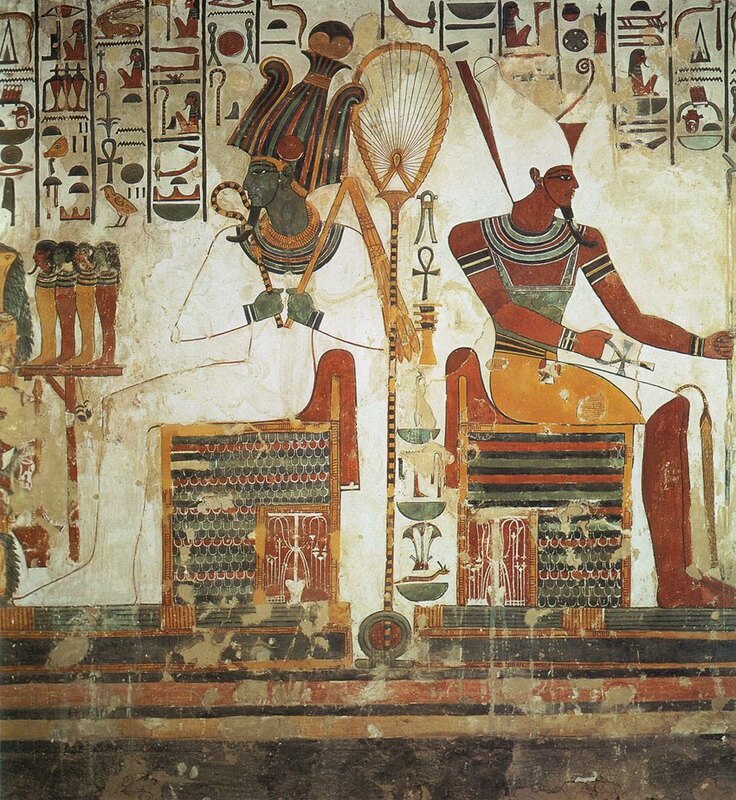 Our Venus has no place in this Egyptian wall painting. These figures are feminine, not female. Every piece of them is artificial, beginning with their iconic way of standing, with shoulders in opposition to head and feet. Try posing this way; it is impossible. 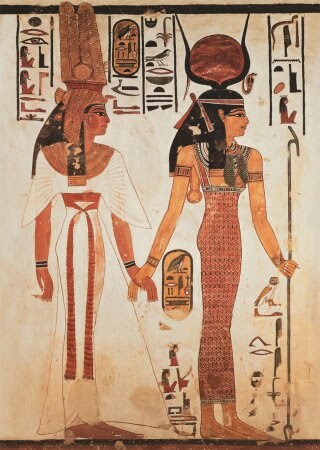 We know who these goddesses are by what they wear and what they carry. This kind of visual clue will remain strong in human representation, right down to the present day. 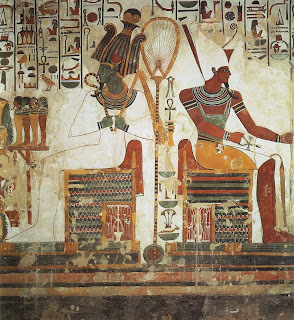 The Pharaohs presented themselves as descendants of the gods. These gods represent an ideal, of what the ultimate human being should be. Greek sculpture attempted a similar end. 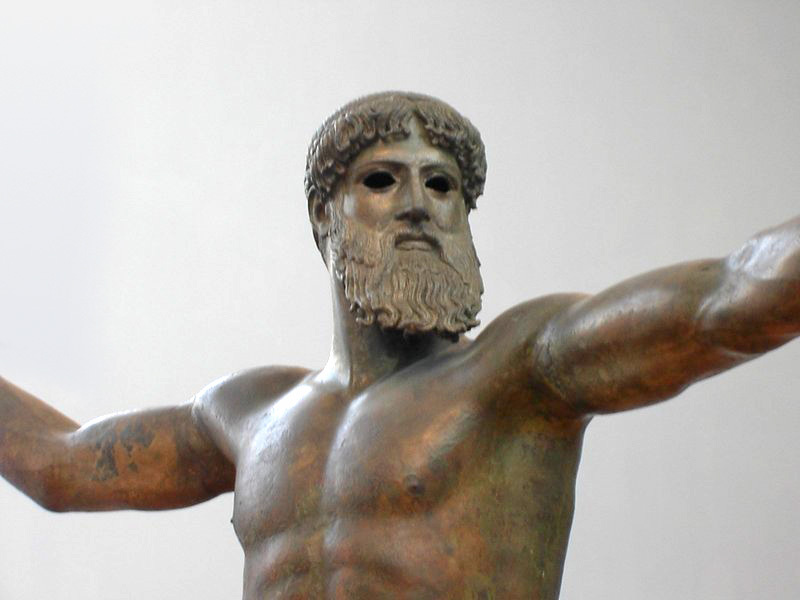 This bronze of Zeus or Poseidon [we're not sure which] looks closer to a normal man than the Egyptian gods. However, this is not your uncle Odysseus, but another invention of the perfect human being. Notice his enormous eye-sockets. Artists have enlarged the eyes of their subjects across millenia, from ancient Egypt down to 21st-century Japanese manga. The next image is one of the oldest Christian icons. It dates from the 7th portrays Saints Sergius and Bacchus. They have large eyes also, but embody a different, less muscular ideal, the Christian martyr. 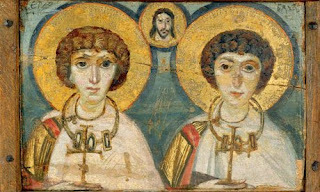 Another departure is that Sergius and Bacchus were presented as real flesh-and-blood people who were born and died. They are direct role models for the Christians in the Sinai Desert, who made this picture. This business soars to great heights in Fra Angelico's painting of the Last Judgment. Once again, you know who's who through visual clues: where they appear, what they wear, etc. Jesus appears top center, with Mary on his right and John the Baptist on his left. On the ground, significant crowd of people has just risen from square crypt holes in the center of the picture. Those on Jesus's right [our left] are welcomed into Heaven, while those on his left [our right] are sent off to Hell. This painting gives us a complete world-view, with both positive and negative role models. Believers knew they should be emulate the people on the left, and avoid any association with the people on the right. To be continued.